Your ATTS instructor is certified by the State of Utah to conduct, teach and certify individuals interested in obtaining their Utah Concealed Firearm Permit. As of this writing, the Utah CFP permit is valid in over thirty states, Illinois not being among them. The course is taught in a classroom setting via Power Point presentation and lecture, where your instructor, a former deputy Sheriff, verses you on Utah law, their training curriculum, firearm familiarity, safe gun handling and storage, maintenance, lawful transportation, and role play scenarios on what actually constitutes a deadly force encounter. We will also cover firearm selection for concealed carry applications. At the end of the course the student’s retention will be challenged with a short quiz. The course runs approximately six hours. All applications, fingerprint cards, fingerprinting, training, notary stamping and application sign-off are included in the course fee. As soon as the State of Illinois passes Concealed Carry, ATTS is ready to train and certify Illinois residents who want to obtain their concealed carry permit. ATTS has been teaching the Utah and Florida Concealed Firearm Permit courses for several years so we are ready to start teaching the Illinois course just as soon as the bill is passed and signed by the Governor. Course fee: $150.00 per student. NO student firearms or ammunition are permitted in the classroom. ATTS now offers a four-hour training course specifically designed to satisfy the requirements of the new Chicago Gun Registration Ordinance that the City has mandated. This one-day class begins with a four-hour classroom presentation and culminates with a one-hour range training session. During the range training session all students will be required to fire a minimum qualification score to satisfy the requirements of ATTS and be signed off for certification. Not included in the course fee are the actual range fees, target costs and ammunition expense. Ammunition requirement: 150 rounds minimum. ATTS offers several basic NRA firearm training courses for novices and beginners. These courses are designed to teach the student safe gun handling skills, routine firearm maintenance, proper storage, and prepare the student to purchase their first firearm whether it is for hunting, target shooting or home defense. The instructor can also be available, at no additional charge to mentor the student while purchasing their first firearm and assure that the student is purchasing the correct firearm for its intended purpose. He will also assure that the student is not being taken advantage of by a gun shop which may be charging above normal prices or looking to make a quick sale regardless of the student’s actual needs. No student firearms or live ammunition are allowed in the classroom. Course Fee: $175.00 per student. Plus a small NRA materials fee. This course is much more involved and requires a much longer range session, which includes the student firing a successful qualification score to complete the course. ATTS offers their "Security Officer Basic Training Course 101" (IDFPR #102-285). These twenty and forty-hour training courses are certified by the State of Illinois Department of Financial and Professional Regulation (IDFPR). 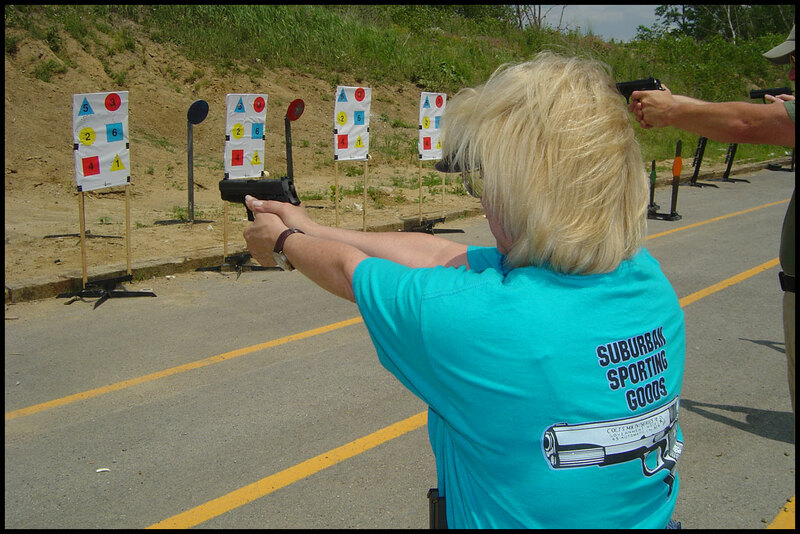 ATTS also offers firearm re-qualification courses for security officers needing to re-qualify for their agency. The twenty-hour course is specifically geared towards new officers who will be employed in an unarmed capacity and looking to obtain their PERC Card. The forty-hour course is for officers who already have a PERC Card but need to obtain an FCC Card to work in an armed capacity. Firearm Re-qualification: Firearm training and re-qualification is available for the following four weapon platforms: Revolver, Semi-auto pistol, rifle/carbine and shotgun. Firearm Re-qualification Fee: $50.00 per firearm. Your instructor is a Certified Training Counselor with the National Rifle Association. As a Training Counselor he is authorized to teach instructor level courses to individuals interested in becoming NRA Certified Instructors. Most instructor-level courses are ten hours in duration and require having completed the NRA Basic Instructor Training course prior to attending any of instructor-level courses. Your instructor is certified to teach the following NRA Instructor-Level courses. Being that this course is considered a prerequisite by many states for certification as a Concealed Firearm Permit Instructor, your instructor requires that all PPOH instructor candidates have completed the Basic Instructor Training Course, the Certified Pistol Instructor, Personal Protection Inside the Home and Home Firearm Safety course before being allowed entry into this course. You must also be able to demonstrate above average marksmanship and excellent gun handling skills. Instructor Course Fees: All instructor level courses listed above without an asterisk are $300.00 per course which includes the NRA required training manual. Students will also be required to pay an additional on-line certification fee to the NRA. *Pistol Instructor, Personal Protection Inside the Home and Personal Protection Outside the Home Instructor Course Fees: $350.00 each, which also include the required NRA training manuals. Students will also be required to pay an additional on-line certification fee to the NRA. If you are a concealed carry permit holder or are routinely armed because of your employment then the ATTS Two-day Basic Tactical Pistol Course should be a must! On Day One you will repeatedly run pistol handling drills until we feel you’re proficient with them. These drills will include establishing your grip, drawing from a holster, re-holstering, multiple types of magazine changes, immediate action drills and moving off the line of force while engaging threats. Day One is held in a classroom setting utilizing inert pistols and inert magazines. No live ammunition is allowed in the classroom! Once our instructors feel that you’re ready, we’ll move you to the live-fire range on Day Two and you’ll perform all of the drills you learned with live ammunition. You’ll also be required to fire a qualification score to pass the course. This class is primarily geared towards Striker-fired and Double-Action-Only (DAO) type pistols. Striker-fired pistols include the Glock, the Smith & Wesson M&P series, and the Springfield Armory XD/XDM series of pistols. All participants will need to provide a handgun, a suitable holster, double magazine pouch, at least five (5) magazines, a baseball type hat and eye and hearing protection. If in doubt, contact us. We are now offering a two-day "Black Rifle Basics" (AR-15 rifle) course, and a two-day "Tactical Shotgun" course geared towards the Pump shotgun platform. We are also offering training in Dynamic Force on Force Air-soft course, as well as a Trauma and Emergency Intervention course. Please see our training schedule for available dates. All three of our two-day tactical courses have been Registered and Approved with the NRA's Law Enforcement Activities Division. Students will be responsible for their ammunition any range fees if they occur.